Chatt About Science: In November 2016, I launched Chattanooga’s science café, known as Chatt About Science. These fun and informal monthly science discussions are designed to bring the community together and support local businesses. I organize the events and moderate the discussions. Bracing for Impact, reported by Flux: In 2014-15, I teamed up with 5 other journalists on a 6-month reporting project examining how communities are adapting to climate change. I participated in crowdfunding, reported and wrote my stories, and edited stories written by my colleagues. The Science Writers’ Handbook: Everything You Need To Know To Pitch, Publish and Prosper in the Digital Age (Da Capo Press, 2013): I contributed one chapter, served on the book organizing committee, and was the Editor-in-Chief of the book’s website and blog. 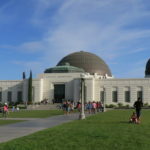 Griffith Observatory: In 2005-2006, I coordinated the research team at C&G Partners that supported the design of the award-winning permanent astronomy exhibits.